Just who does this Denny Hamlin think he is? He ends last season by saying he’s gunning to knock Jimmie Johnson off his perch. Then Hamlin defies logic by tearing up his knee playing hoops. Then he follows that up with surgery, and then goes out and wins a race just following surgery. As if that’s not enough, the outspoken challenger essentially blows off Sonoma because there’s no road course in the Chase. Then the topper: he predicts a victory at Martinsville…and wins there. Some call it chutzpah. Others call it cockiness. However you describe it, Denny Hamlin has it in doses that are at least equal to the defending champion. Someone wise once said, “As a man thinks in his heart, so he is.” In other words, it doesn’t hurt to talk the talk as well as walk the walk. Who else will believe in you if you don’t believe in yourself? Put another way, Hamlin became his own biggest cheerleader, not a bad idea considering more than a couple of folks thought D.H. was off his rocker for thinking he could topple NASCAR’s king of the hill. If there’s one area where Jimmie Johnson seems to have rubbed off on Denny Hamlin, it’s in the area of planning one’s work, and working one’s plan. One could argue there are other drivers out there who have as much, if not more talent than Hamlin, but where he has the edge this year is in having a firm grasp on the big picture. Every step taken seems as though it was all a part of a bigger plan. Of course, none of this means jack if you can’t back it up. 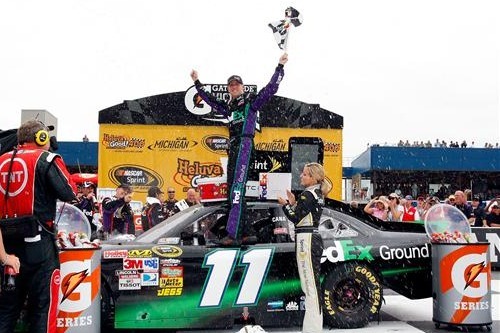 The amazing thing about Hamlin has been his ability to – with uncanny skill – forecast his finish. The key is to know your strengths and weaknesses, and he seems to have a good handle on them. More importantly, it helps to have talent. You can say the right things, and lay out a good plan, but if you don’t have the talent, it doesn’t matter much. This season, Denny Hamlin has expanded his track mastery beyond Pocono and Martinsville. With wins at Texas, Darlington, Michigan and Richmond he is showing he’s no one-trick pony. Dare I say Denny Hamlin has become a thinking man’s racer? If not that, one could certainly suggest he’s added an element of psychological warfare, a la Darrell Waltrip. With four races to go, and two other drivers in serious contention, it’s far from over. That doesn’t even take into consideration the wild card race that is Talladega. Is a combination of control, composure and competitiveness achievable on 33-degree banks at 200 miles per hour for 188 laps? The make or break week could be right here. Denny Hamlin may have a ways to go yet before he can match Jimmie Johnson’s resume. Heck, there are few in NASCAR history that can. Yet, if there’s one area where Hamlin is coming on strong, it’s in moxie, or as one coach put it, “Fake it ‘til you make it.” These days, it seems as though the driver who’s chasing the champ at a historically close rate is less about acting the part, and more about being the part.